Did Galina ever seduce a man into her bed? Did she ever find herself in that mellow surrender, with an even heartbeat, as she groomed her body — the millions of skin cells she had never cared for before — as she waited for her lover to take her out on the town, for a walk or a dinner at his parent’s home; so that later she could be disrobed, explored and tasted? consumed and worshiped, cared for? Had she ever learned what it was like to know a man so intimately she could tell what he’d drunk for dinner just by the flavors of his bodily liquids? And had Galina known elation, the best kind of which can be experienced only in the highs of being in love; and was she then able to foresee that even though loss would eventually follow — always follow — it was all worth it, while unfolding? “Hey, Mash? Isn’t that your girl hugging the fence over there, behind the tractor?” the women approached Galina’s mother, amused at first, but not for long. The women of the village began to shun the cripple. A fair competition or not, for all they knew, Galina shared the same anatomy between her legs; and men, being a canine type, let’s face it, wouldn’t have the will power to say “nyet” when an opportunity of getting some — of getting any — splayed out in front of their panting mouths. No longer was Galina invited to join the girls-in-waiting on village benches whenever they saw her limping with her cane, at dusk. They didn’t brush her hair, didn’t massage her bow-like back; or reached to scratch mosquito bites through her thick woolen tights, during the summer nights. When she showed up at church, the girls dispersed, but not before hissing a few slurs that could be overheard even by a deaf-mute. As far as they were concerned, it was better to be safe than find their boyfriends venturing out for some lay on the side, which, considering Galina’s growing neediness, was always nearby and easily available. Galina’s mother took mercy on her daughter. What else did she have going for her but those innocent fantasies of rescue via marriage and the care of a man? But the poor simpleton! She had yet to learn that guilt and pity she provoked in other women made terrible accomplices, in the end; and that a woman’s generosity ran only as thick as her man’s attentiveness. But listen she did. The very next Sunday, Galina didn’t dress up for church. She didn’t leave the veranda where she slept in the summer, to then wait by the side of the dirt road, to catch a ride in the milkman’s horse-drawn carriage. She stopped visiting the fields, or strolling through the village in search of young girls’ congregations. It seemed she locked herself at home during daylight. And only at sunset did she begin to leave the house and joining the babushkas: those old retired women who were cared for by their children if they were lucky; and if unlucky, the women who worked until their daily duties were completed after the last cow got home. They sat on the benches, like brown sparrows along a telephone line; stretching their arthritic limbs, adjusting their kerchiefs and shacking roasted sunflower seed with toothless gums, until their fingernails turned black and their tongues were raw and scarred by salt. There they sat, watching the rest of the living go by, and calling out to either Jesus or Mother Death, for the end of their — or others’ — misery. The old women crossed themselves. Their religiousness did not die down, not with the revolution or the Party’s teachings. Harmless to most, they worshiped openly; and these old women had a point: What else would there be left of Russia’s soul, if not its fear of Father God or Mother Nature? There, in the companies of babushkas, Galina started to pick up the dirt on every household in the village. And what a way to make a recovery! No matter the shared elation or tragedy, most mortals couldn’t resist a juicy piece of gossip. Quite rapidly, Galina became the go-to for the latest news: She was the younger generation’s Sputnik that circled the village — from one bench to another — to measure and deliver back the temperatures around town. The misstep of her own fictional marriage was long forgotten, and by the fall — before the hay had finished drying out and got transported into hay storage shacks; and long before the housewives completed pickling cabbage and lining up their cellar shelves with jams; before the men piled up the wood for heating the stove in the winter — Galina became every household’s most welcomed guest. Now that she’s arrived, was there anything else to it? A life summoned itself and paused for a while. Yes, there was always a pause, Larisa noticed; a breather in between the chapters. She never imagined her death, never was the type to bear the hubris of planning her own funeral. Like weddings, death demanded metaphors. To capture oneself, to be summarized, direly: But how can one not be so many things at once? Besides, the way she felt, ceremonies strived for a shared experience; not a centralized meditation that treated the self as the object of all other events; that separated and sought how different one was from the rest, taking for granted the universality of it all. She didn’t have the ego for it. Larisa had been living for others, certainly: a symptom assigned mostly to her gender. In her family, she had witnessed the earlier generations of women lose themselves in sacrificial love. For the sake of their children, their husbands, their aging parents, they carried on serving; until they found themselves having a hard time remembering what they themselves had wanted, originally, all along. Remember those days? How many times she’d heard the mournful reminiscence in a woman’s voice: Those days! What happened since then, Larisa wondered, herself still a young girl; what force of obscurity slithered itself in between and demanded for a retraction, or a delay at least. Definitely, she wouldn’t lose the sight of her own purpose, she thought! Yet, the loneliness came scratching at the backdoor, becoming louder as she compared the things other women claimed as accomplishments: dramatic courtships, the victory in which meant expensive weddings and doting husbands, as one could only hope; then, the automatic events of pregnancy and nest acquiring (building, building, gaining weightiness); the demands of a chosen lifestyle, or in the cases of the less fortunate — merely survivals. Every woman she knew had leapt into all of it without ever questioning the reality of her expectations. How could their husbands — the equally unknowing human beings with a whole other set of expectations imposed onto them — keep up? They too, when young, once dreamt of following the call of the world’s magnificence. But lives demanded to be defined by success; and what others made of success — was not at all what she’d imagined. There was love, of course. There would always be love. Beyond her own anxiety and self-judgement, she could see that a life was only as successful as the love one projected. Still, in the beginning, it was loneliness that determined the pursuit of it; and loneliness made things more urgent, non-negotiable and somehow crucial. It conformed the shape of love, so it could fit into the missing parts; make-up for the previous mistakes of others; fix, mold, make it better. Because in a person, there were always parts missing: from too much love, or not enough of it, from the prototypes of our lovers (god bless our parents! ), who couldn’t possibly step up to what love was meant to be, as she thought of it: all forgiving, non-discriminating, fluid. And what about the needs? One had to have needs. It was a path of nature. Larisa found the balance between the self-fulfillment of those needs and the ones she could hand over to another — unpoetic and stressful. So, she chose to handle all of them on her own; not with any sense of confrontation or showmanship, but with the esteem of self-reliance. And surely, Larisa thought, it would only elevate the love. Surely, if one handled the demands of one’s survival with this much grace, there would be more room for the beauty and the compassion; the reflection of the self in the suffering of others and the almost rapturous feeling of knowing exactly how it felt to be another; for such a love lacked fear, and it could take up spaces with its tide-like tongues, and whenever it retracted, one only had to wait for its return. In light, in easiness: What surrender! Larisa wasn’t really sure how or where, in the self, the unease began. On that day — a day unmarked by any significance — she’d gone into a church. With her head bowed and eyes half-closed, she didn’t seek answers or help, only a space from which to observe the ways her thoughts moved, sometimes birthing moods, sometimes — nothingness; and she watched herself alter, even while in stillness, mind creating matter; thoughts becoming intentions; and she cast the net into the endless vagueness and brought them back into the very is-ness of her: Into what she believed the most. This church appeared make-shift, marking a spot where, under an influence of a former fanatical thought, an ancient Russian cathedral had been burnt down over half a century ago. A modest wooden building, unheated, undecorated, in a shape of a polygon, sat in the shadowy corner of a square. The country was living through an era of resurrected gods and revalidated heros, often dead by now, having been taken for granted for the sake of simplifying a former common ambition. Things crumbled. Alliances turned chaotic. And when everyone woke up to amended history — figures worthy of worship long gone and nearly forgotten — a common panic ensued. For even if it weren’t the ego that made a people matter, it had to be their spirit; a common memory of a civilization. The roads had frozen overnight; and at first, she had snuck-in to thaw out her stiff toes. She purchased a candle at the door, mostly out of habit. She didn’t even know how that particular ceremony worked. Two side altars, with figures of crucified saints, sat against the walls of the church, opposite of each other. Standing there for a while, still and unnoticed, she studied the other women who moved like ghosts across the dirt floor. Everyone was fully clothed. She looked down at her feet and shifted: There was little hope of her finding much warmth there. Still, she stayed. She paused, and in the growing shadows of her memories, she waited. Older women in head scarves, with histories written across their tired faces, were crossing themselves at their chosen mantels. Some moved their lips in prayer, repeatedly lowering their heads in a manner that came after so much practice, one was no longer moved by it. What misfortunes had brought them here? Loss required humility, otherwise one was consumed with fury. Her country had lived through tragedies with a numbness of habit. Resignation was often advised by the elderlies, yet she found herself incompetent at it. She took another look at the suspended saints and walked over to the side alter with a Christ whose eyes were semi-open. A little girl in a rabbit fur hat clung to the leg of her grandmother. Larisa looked down at the child and without raising her hand, moved her fingers inside the mitten. The child, sensing an interaction, got shy and clutched the old woman’s leg with more zealousness, for children often appeared overwhelmed with the energy of living. Their egos struggled with the life force they had been granted (what were they supposed to do, to be? how did they matter); and juxtaposed against the even flow of hours — one’s magnificence was only seen in silence, she believed — the egos expanded; for surely, they had to become something better. Inna woke up to the sound of the television set, located on the other side of her bedroom wall. It was a common occurrence in their apartment: everyone’s mandatory obedience to the schedule of her mother’s whimsy. Sunday mornings of waking up to blasting music, recorded from the previous night’s TV concert, for which Inna was rarely allowed to stay up, were a part of the family’s routine. Each time, Inna would attempt to ignore the ungodly hour and bury her head under the pillow where she would often find a flashlight and the book that she had been reading, in secret, under the covers, the night before. There, she would give her interrupted dreams another try. But knowing her mother to be convinsingly oblivious, soon she would give up on any hope for silence; throw aside the covers in a fit of rebellion, and march into the kitchen, sleepy, grouchy and barefoot. (To protest mother with her own loud noises was her only resource — NOT that it would be of any success). Father was often already there, at the wobbly kitchen table, slouching over the Sunday Pravda, with a large cup of black coffee, next to the bowl of white Cuban sugar. “I’ll say!” she would respond. Recently, she had also begun to notice her parents’ lackluster attempts to hide their arguments from her. It was as if the two adults had suddenly grown tired, like many others in their town. And while it appeared that everything else in the country was hurriedly revealing its flip side — scandals competing for the front page news, daily — Inna’s parents had also stopped putting up a front. These days, father tended to drink more. Mother bickered, easily irritable; and she eventually maneuvered their every argument to the deficit of money. Still, father would never criticize his wife in front of Inna. To the contrary, it was Inna’s mother who took such liberties in their one-on-ones. And at first, Inna was thrilled: Was mother also changing, from a strict disciplinarian to her friend and confidant? But on their rendezvous into the city that summer, she quickly realized that mother’s confessions were a one-way dynamic. Never was Inna permitted to quote her mother’s list of grievances or to voice her own. She was there to merely keep her mother company; and it would be in her own best interest to adopt the delicate understanding of exactly when she was her mother’s ear — and when she was quickly demoted back to being her inferior (which quite often, as it turned out, happened in the company of other adults). But this was a Monday morning. With father traveling to Baykalsk, Inna was alone in her frustrations. School would start in a couple of weeks; and she began anticipating the strenuous studies her first year of Junior High had in store. After all, this was the year that everyone determined a profession and chose their future institutions. Some boys would choose the army, although military service was no longer mandatory. Inna, as most adults predicted, was bound for her mother’s job. Which meant that after this year, she would be headed for the Pedagogical University No. 3. “This once! Couldn’t she just let me rest, just this once? !” To stifle a grunt, Inna ducked under the pillow only to find the second — and the more tedious — tome of Mikhail Sholokhov’s Tikhy Don, which she pushed herself to finish, even if for the sport of being the only student in her class who had read everything on their summer reading list. Not bothering to change out of her nightgown — “Maybe then she will feel guilty!” — Inna forwent washing up and made her way into the living room, from where the sounds were coming. She had hoped to make enough noise with her bare feet, as well as the bamboo curtain hanging in her doorway, to let mother know that she was coming. And: that she was pissed! In the living room, she found mother, in nothing but a beige bra and a pair of matching, shape-enhancing bicycle shorts that she would always wear underneath her pencil skirts. She sat on the couch, nearly slipping off its seat cushion from leaning forward. Mother’s right hand covered her mouth, as if to stifle any sound of torment. Her eyes were glued to the TV screen. At first, Inna assumed that mother was consumed by a documentary on one of the recent upheavals, of which, since the start of Gorbachev’s perestroika, there had been plenty. When a newscaster with a knitted brow interrupted the footage, through the bits of fragmented news Inna gathered exactly what she had nearly slept through: Gorbachev’s heart attack. Change of leadership. Moscow in a state of emergency. It wasn’t the first passing of a leader in Inna’s lifetime, but she was too little to understand the grieving of the nation that followed. But Mikhail Sergeyevich Gorbachev: She liked him a lot! She found him to be one of the more handsome General Secretaries that the Party had ever had; and even though in recent folklore, he was the pun of multiple jokes — for his Ukrainian accent or presumed provinciality — he seemed to be a less mysterious figure, often appearing among crowds, talking to factory workers; and laughing with children, women and American politicians alike. The newscaster proceeded building sentences that to Inna’s mind, still groggy from sleep, sounded nonsensical: The roads leading in and out of Moscow appeared to be cut off. There were reports of downed phone lines. New leaders were in place. The news seemed mixed, somehow suggestive; but already it appeared that this was not a typical succession of one leader after the next. Mother, silent and unaware of Inna, sat still; and Inna knew: All was quite serious. “Ma?” she said softly, fearful to approach. “How long?” She couldn’t finish her thought. She found herself unsure on how to act in time of great upheaval. 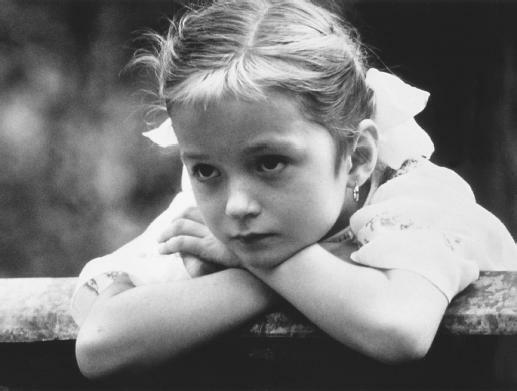 When mother looked at her, Inna remembered how prettily her eyes appeared in photographs. In the darkroom that mother always made in their half-bathroom, Inna liked to walk along the shower curtain with drying black-and-white photographs and study the wet images. Unlike Inna’s eyes — of bluish-gray, as if diluted from her father’s (a metaphor or a simile here?) — her mother’s irises appeared nearly black; mysterious and endless in all photographs. But father’s eyes! When on the previous month’s salary, the family purchased a color camera, for the first time Inna would notice just how blue — was their blue. And often, they appeared illuminated by a stifled smile, as he the shutter caught him in the midst of reading Gogol, out loud. They heard from father on August 22. By that time, all of mother’s quiet stoicism had long dissipated. She now wore strictly head-to-toe black attires when out on the town. She left the apartment every morning, returning with a group of worried-looking girlfriends who served her tea, rummaged through the kitchen drawers, and for some reason always spoke in half-whisper whenever Inna entered. For several days, Inna had gotten her fill of the news: Her favorite General Secretary was fine after all, but out of the city on vacation. She’d also seen reports about a young politician called Boris Yeltsin, who climbed onto the tanks and spoke willingly, from make-shift barricades, to both the Russian people and the press. When townswomen came to take over the living room, Inna returned to her bedroom. The women’s eyes on the TV screen, their spoons — in the jars of homemade jam, they whimpered when the news shifted from uncertain to anything poignant or tragic. Some pecked at Inna’s mother; while others crossed themselves and nibbled on their crumpled, pastel-colored handkerchieves. The other women clumped together in the bedroom doorway, and finding it impossible to get past their motherly behinds, Inna gave up and listened to the bits of news from the other side. She looked outside the window. The town’s cobblestone road glistened from that afternoon’s rain. Inna remembered when, from the kitchen stove back at her grandmother’s one summer, she witnessed the old woman lower herself onto her knees. Grandma had come out in a nightgown, in the middle of the night, to fetch herself a glass of water. Her head, for a change, was barren. A gray, long braid ran down her spine. At first, the woman studied the black window with her own ghost-like reflection; and traced the cold glass along her lower jaw. Before she kneeled, grandmother put down the glass, lifted her nightgown’s hem, and looked over her shoulder. Inna, in her hiding spot, stopped breathing. That was the first time Inna ever witnessed prayer. She now imitated the old woman’s actions, slowly recalling them from memory. Once kneeling, she felt awkward, silly. But she forgave the unfamiliarity of the moment and lowered her head. At the risk of missing their bus, Inna’s mother insisted on stoping by the kiosk that, judging by the sour smell of yeast and the line of bickering women upfront, had recently received a delivery of fresh bread. It was an otherwise insignificant place, like most stores in larger cities. As a matter of fact, when the kiosk windows were rolled down and locked, one could easily mistake it for an information booth, with nothing inside but trolley tickets and city brochures, and Marlboros for sale. “I just wish I had a girlfriend to take me to the ballet, Innotchka,” she confessed to her daughter, melancholically. It was an uneasy situation whenever mother began talking like that, as if Inna were her contemporary. But just as Inna was an assumed loner, being the only child of her parents — who were the only children to their parents as well — her mother, she suspected, had difficulty making friends as well. In the summer of 1991, the two women would journey into the city quite frequently. Mother had applied to the Masters of Education faculty at the Pedagogical University No. 3. Every academic institution, from kindergartens to the top level institutes that trained the best minds of Russia’s science, was assigned a number. And although Inna, during the trips into the city, had never come across the Pedagogical University No. 1 or No. 2, she was sure her mother would not possess any trustworthy information on this curious matter either. Most likely, she would grant Inna the chronic “It’s just the way it is!” response. Inna’s own school — where mother had established a certain reign, especially since deciding to further her credentials — was assigned the number 7. She realized she had never tried to decipher this puzzle before. Perhaps, on certain topics, mother was right: Some things — were just the way they were. On the way back from her mother’s interview with the dean of her future faculty, the two women had stumbled upon a display of oval white flatbreads in the window of a curios little kiosk. It stood at the entrance of an alley of chestnut trees which would lead them to the city’s main transit station. Inna, with her eyes studying the tips of her and her mother’s shoes, while mother talked and talked — this time about just how “cultured” the dean had acted toward her, a real gentleman not to be found in a single kilometer radius of their own village — she noticed when her mother’s feet slowed down, their oval toes slightly tilting away, at a forty-five degree angle, as if pulled by a magnet. Inna adjusted her mother’s purse that she had been carrying since they left the nail salon, then moved up the adult size prescription glasses to the bridge of her nose from its tip, and gave the object of her mother’s curiosity a considerable study. “They are! Oy, they are, they are! They are little lavashes! Oy, dear god!” Mother was under a spell. Inna, who had been trained well enough to know that all of her mother’s sudden outbursts had to have specific objectives, had recently begun to notice her own decreasing desire to figure them out. With her stubborn, teenage silences toward any hints, she figured out that her mother’s desires would become obvious, whether she tried to decipher them on her own. Or, she could just wait. Oftentimes, those objectives would become clear. Some would be meant to provoke pity from any witnesses; and it confused Inna by giving her no active understanding on what to do next. Certainly, mother couldn’t have thought of pity being a good match to her self-proclaimed dignity! By now, her mother was trotting. She was wearing a tailored skirt the color of pink-lavender and a custom-made black-and-white blouse with polkadots and a giant bow on the left side of her neck. Her red stilettos, claimed to be the best damn pair of shoes mother currently owned, made her legs more defined, although still quite plum for mother’s short frame. Adjusting the handles of the sizable purse again, Inna thought: Were she not the daughter of this woman, who was jittering lusciously in all the right places while running through the alley of trees (that used to fill the air with an aggressive perfumed smell of blossoms, back in July), she would think of this sight as some famous passage from an Italian film, in which the women — who all seemed to suffer from outbursts of erratic and unpredictable emotions — were the only ones in the whole of the world’s cinema to even slightly resemble the women of her own culture. By the time Inna had caught up to her mother, having been weighed down by her sizable purse and the damn oversized glasses that refused to stay in place, mother was already lingering by the kiosk window. With her hands folded on top of each other over the giant polkadot bow, she jumped a couple of times in place, causing for the other women to look on, askance. They were right: There was something insincere in the forcefulness of mother’s emotional exposés, especially when they involved retardation into her girlhood. In the now obvious and not necessarily pleasant silence that surrounded them, Inna continued to clutch the handles of the purse with her both hands, while stealing glances at the other women who by now resumed their hushed conversation. The kerchiefed woman scoffed, slightly shook her wrinkled head and rolled her milky-gray eyes in a conspiring gesture. Inna’s mother feigned being immune toward the meaningfully condescending responses that trickled down to the hummed exchange among the other women. There had been times when Inna had witnessed it go a different way, however: Sometimes, mother teared up at the injustice and at the disheartening simpleton nature of her fellow citizens, while always managing to stand in enough light to be noticed by her offenders. Other times, she chose to suffer through the unfortunate consequences to her own bouts of aristocracy. Considering that these baked delicacies were impossible to come by in their village, this would be one of those times. So, Inna’s mother squinted her eyes, as if studying other choices of produce that may interest her; then made her way to the back of the line. “Are you last?” she asked a woman with an eggplant-colored perm and a still fresh layer of frosty pink lipstick on her narrow lips. “Umn-da?” the woman nodded. Inna wondered if the Italian women from the films also possessed such a succinct vocabulary of arrogant gestures. Inna’s mother, again, appeared to be oblivious to her dislikable affect on the group: “How wonderful!,” she said gleefully, “I’m — after you!” Then, she yanked Inna by her elbow, to take her place in line.